Here's a great news for fellow DiGi Prepaid Mobile Internet users! What if I tell you that you can win yourself a super cool new Vespa? Some of you might have already aware that DiGi has launched the 60 Vespas in 60 Days contest earlier this month. DiGi Prepaid mobile internet customers stands a chance to win a Vespa LX150 worth RM8,800 everyday from September 2 to October 31 2013. If you're a DiGi Prepaid weekly and monthly mobile internet subscribers, you'll be automatically be eligible for at least 1 entry. For those who are still considering subscribing to mobile internet, why not take advantage on this cool contest? You're not only finally get connected through your mobile devices but also stand a chance to win yourself a Vespa! You can enjoy the flexibility of choosing a mobile internet plan that suits your usage needs and there will be no more the day where you miss another Whatsapp message or could not update your Facebook whenever you wish to! 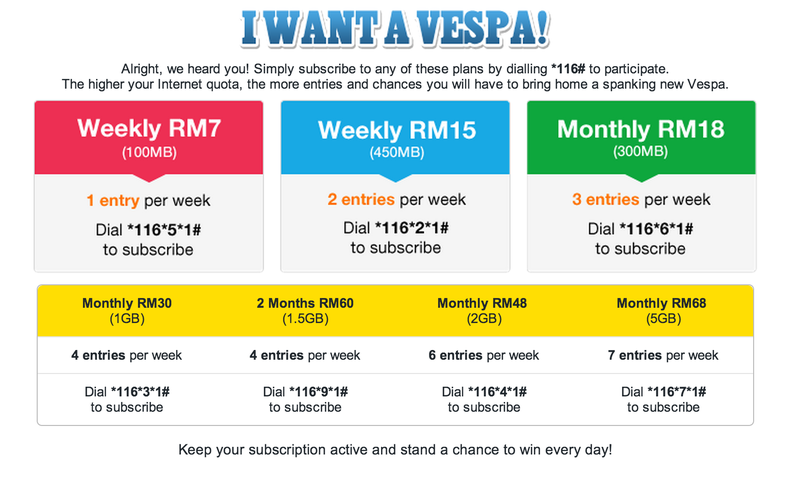 To stand a chance to win a Vespa, DiGi customers only need to dial *116# to sign up for a mobile internet plan. You can choose from the Weekly RM7 for 100MB to Monthly RM68 for 5GB of data. The Weekly RM7 subscribers will be entitled for one entry while the Monthly RM68 subscribers will be entitled for 7 entries in the system. There you know the higher the value of the mobile internet plan you subscribed, the greater the chances of winning! Don't you think it's super cool and awesome to have one Vespa for yourself? And you can show off on the street with your classic and adorable ride ever! What are you waiting for? Dial *116# now or visit http://bit.ly/18OkyC1 to win yourself Vespas!